A Chinese version of this post is available below. 中文版在下面. As Typhoon Fitow greeted Taipei this weekend with wind and rain, l somehow found comfort in listening to Lara Liang’s hit song, “Rainy Day 下雨天”. 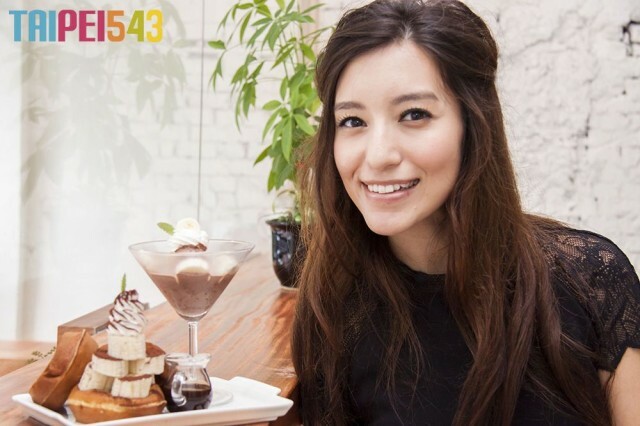 We recently sat down with the talented Lara, also known as Lara Veronin, at Chu In Cafe to learn more about her career in the Taiwanese music industry. And if you’ve never been fortunate enough to see her perform live, you’ll get your chance at the upcoming Taipei543 Neon Run! We’re excited to have you perform at our Neon Run! What tips do you have for exercising and maintaining a healthy lifestyle? Honestly, the keyword [is] “lifestyle” because I think a lot of people get in the habit of really unhealthy dieting patterns and even over-exercising. The key to maintaining anything is making [it] enjoyable, making it a part of your lifestyle. When I first entered the Taiwanese entertainment industry, I used to diet, but instead of losing weight, I gained weight and it was horrible. For many years, I didn’t have a normal relationship with food, dieting, and things like that, so I finally quit and just wanted to be healthy. I also do yoga…it’s not really about losing weight, it’s about changing your relationship with your body and fine-tuning things—and not having any “restriction foods”. It’s about being good to yourself. Before we talk about your musical career, can you first tell us three interesting facts about yourself that people might not know about you? 1. Whenever I hear clapping, even if it’s on TV, I start clapping as well. It’s like a natural instinct for me. I know you’re originally from Los Angeles —how was the experience of moving to Taiwan after growing up in LA? As a child, my family and I actually moved back and forth from LA and Taipei many times—like every six months. This continued until my sister finally declared to our parents that she and I liked being at TAS (Taipei American School) and wanted to stay in Taipei. TAS is full of mixed-race Taiwanese students who spoke Chinese AND English! It is where I felt like I was being accepted. This all is a part of how my sister and I started TAWKI, Taipei As We Know It, a new webseries. We’re hoping to let people know what it’s like to live in Taipei, and just how great it is. We recently released, “Scratch and Win”. It is not the pilot episode, but a snippet of TAWKI that introduces one of the characters. We have not started filming the webseries yet, and we will be beginning our crowdfunding efforts soon, so stay tuned! That sounds great – we’re looking forward to it! Can you tell me about your childhood and how you got involved in music? My father was a singer/songwriter and my sister and I always loved singing when we were younger. I used to play the violin and was tired of carrying the instrument everywhere, and one day someone told me about choir, and that’s when I was more involved with singing. I entered the music industry while I was still in high school and originally signed as a solo artist, but later I became part of a band, Nan Quan Ma Ma (南權媽媽), with three other males. How was your experience with being a part of 南拳媽媽? Any awkward moments being the only female in the group? Yeah, of course there were lots of awkward moments, but I learned a lot from them. I got really good at changing in the car! Sometimes we did not have enough time to change, so the boys just changed in the car. I would tell them to look the other way and did the same. But really, it is because of 南拳媽媽 that I saw the other members write their own songs, which made me realize that I could do it too, so they helped me get into songwriting. You also sang “Coral Sea 珊瑚海” with Jay Chou, how was it like working and touring with him? At first it was surreal. I remember when they first told me Jay Chou was in the building, I immediately stood up and asked, “Where’s is he?! ?” But now he’s like an older brother to me and it’s an interesting switch, when his songs were all that me and my friends ever sang at KTV when I was younger. Initially, I was shy about performing at his concerts. It usually went like this: “Hi, I’m Lara”, a performance, and then I went off stage. But later, I watched and learned from other performers. Now that I am a solo artist, the stage is mine and I’m always aiming to connect with my audience whenever I perform. Now that you have gone solo, how has your musical career changed? Going solo gives me a lot more creative freedom. For my last two albums, I was able to write my own songs, work on creating different themes for my two albums, Hello Lara and Free Spirit, and the songs within each album all relate to the album’s specific concept. Now, it has been more about creating the music that I want and not necessarily the pop music that everyone sings to at KTV, so it definitely has its advantages and disadvantages. Hopefully a concert in January, and the concert will have [a] theme that immerses the audience in both a visual and audio experience. Aside from working on TAWKI, I will also be working on another album and collaborating with other artists as well. I’ve realized that songwriting isn’t hard for me, but I want to make music that will move people. Can’t wait for what Lara has in store for us next! Stay up to date on news about the Taipei 543 Neon Run below and see Lara perform. *Come to Taipei543 Neon Run 5K 螢光夜跑! *Come to Taipei543 Neon Run 5K 螢光路跑!